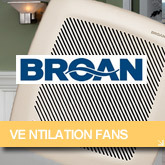 ALL Bathroom Ventilation Fans on Sale. *Same Day - Fast Free Shipping! Sometimes referred to as general, central, whole-house or primary ventilation, continuous ventilation is used to remove stale air and provide fresh air on a slow, continuous basis. A well-designed airtight home can generally use low volume continuous ventilation. Sometimes referred to as spot, local or secondary ventilation, intermittent ventilation is used to capture and remove pollutants quickly at the source. Pockets of excessive moisture and pollutants can build up in the bathroom, kitchen, utility room, garage and home office. This secondary process serves to exhaust these problem areas quickly, before "bad air" can spread throughout the house. Just as important as continuous ventilation, intermittent ventilation complements the effort to improve indoor air quality. Intermittent ventilation quickly ventilates contaminated areas and often uses less energy, which results in less exposure to occupants than the slower continuous ventilation process. Both systems exhaust pollutants from the air, but intermittent ventilation is more effective in concentrated areas.